At any time when using the Play-Fi app, or from the Play-Fi applet in Windows, if you want to add more speakers, just press the Play-Fi icon. In the apps, the icon is in the bottom right side of the screen, and in Windows, it appears in as a system icon in the lower bar. This will open the Play-Fi Control screen. On this screen, you can see the speakers tied to each source and adjust their volume individually or all together. Pressing the Add/Remove button will expand the speaker list to all of those on your network, and allow you to make any changes you like to the current set of active speakers. 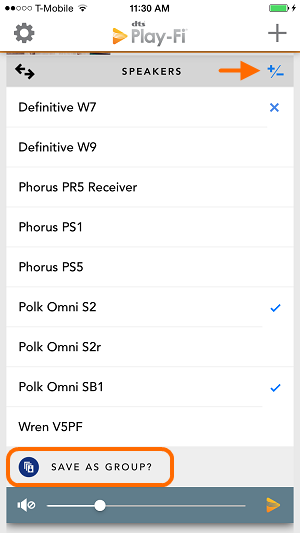 If you really like this set of speakers, you can make them into a preset Group, so that you can easily select them for playback, or even have them automatically connect when you launch the app. To do this, just select the “Save as Group?” option at the bottom. You’ll give them a name and be all set. 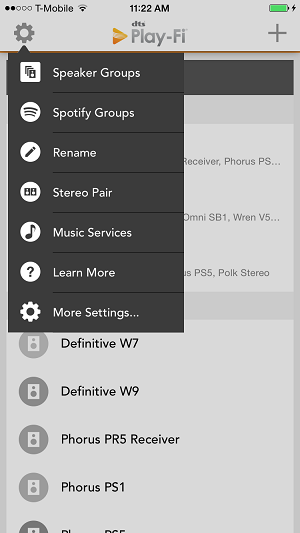 If you ever want to make or edit groups outside of playback, just hit the Settings button on the Play-Fi Control screen, and select the Speaker Groups.